Collaboration between physicians in different specialties is often taken for granted. However, poor interactions between family physicians and specialists contribute significantly to the observed discontinuity between primary and specialty care. The objective of this study was to explore how collaboration between family physicians and specialists was conceptualised as a competency and experienced in residency training curricula of four faculties of medicine in Canada. This is a multiple-case study based on Abbott's theory of professions. Programs targeted were family medicine, general psychiatry, radiology, and internal medicine. The content of the programs' objectives was analyzed. Associate deans of postgraduate studies, program directors, educators, and residents were interviewed individually or in focus groups (47 residents and 45 faculty members). The training objectives related to family physicians-specialists collaboration were phrased in very general terms and lacked specificity. Obstacles to effective collaboration were aggregated under themes of professional responsibility and questioned expertise. Both trainees and trainers reported increasing distances between specialty and general medicine in three key fields of the professional system: the workplace arena, the training setting, and the production of academic knowledge. The challenges of developing collaborating skills between generalists and specialist physicians are comparable in many ways to those encountered in inter-professional collaboration and should be given more consideration than they currently receive if we want to improve coordination between primary and specialty care. The aim of this study was to develop a deeper understanding of how generalist-specialist collaboration is learned within medical schools, using Abbott's systemic theory of professions as the theoretical framework. This framework integrates concepts of professional identity, professionalism, and professional interactions–all central to collaboration. According to Abbott's framework, the concept of specialization, and therefore of expertise, is fundamental to the professional system. Every profession must constantly defend its legitimacy and jurisdiction to preserve its social status among the system's other professions in three key fields: the workplace arena, where professional boundaries are negotiated on a day-to-day basis; the training field, where professional identity is shaped and commitment to the profession is inculcated; and the academic knowledge field, which legitimizes professional work and provides opportunities for developing new expertise. [12, 13] Abbott also specifies that, in any profession, members' ability to differentiate themselves from each other is fundamental. This differentiation supports member autonomy and the pursuit of personal aspirations, but can also generate tension. According to this conceptual framework, the educational system, where future professionals are trained and academic knowledge evolves, is a key determinant of professional collaboration. The study was carried out in four Canadian medical faculties. We chose to target postgraduate training programs, where the professional identity specific to each medical discipline is shaped. Our research questions were the following: How is collaboration between family physicians and specialists approached in the formal curriculum of such programs? How is it experienced day-to-day in academic medical centers that constitute for trainers and trainees a workplace, a teaching setting, and a setting where knowledge is produced and transferred? While medical practice in Canada is under provincial jurisdiction, training programs are nationally accredited. Although each of the country's 17 medical schools has its individuality, core programs must respect national standards. Competencies are defined at the national level by the College of Family Physicians of Canada (CFPC) and the Royal College of Physicians and Surgeons of Canada (RCPSC). In 2000, the RCPSC revised its approach to training and program accreditation, adopting a competency-based approach. The foundational document, CanMEDS 2000, proposes seven competencies, including professionalism and collaboration. In contrast, the CFPC's approach to training and program accreditation is based on four principles considered to be the founding values of family medicine (Figure 1). Postgraduate-level trainees are "residents"; family medicine residencies last two years and specialty programs, five. Family medicine residents are attached to a family medicine teaching practice throughout their residency, generally in the community setting. 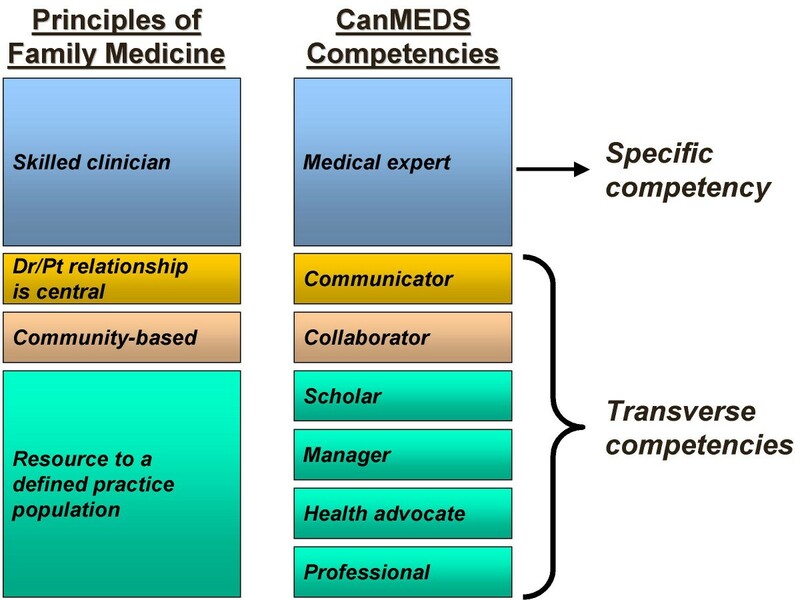 Mapping of the four principles of family medicine and the seven CanMEDS competencies. This study used a multiple-case design, each case being a medical school. In 2003–2004, four Canadian medical schools were purposefully selected to contrast on two characteristics: geographical region (Eastern Canada, Quebec, Ontario, and Western Canada) and mission (orientation towards community and general practice (n = 2), or specialized care and research (n = 2)), since it was suspected that medical schools' missions may affect how collaboration was addressed in the formal curriculum. The researchers' school was excluded from the sample. Residency programs targeted were family medicine and three specialty programs–general psychiatry, internal medicine, and radiology–that interact often with general practice. The choice of the latter may surprise, but radiologists are trained, among other things, to act as consultants to general practitioners on the appropriate choice of imaging technologies to investigate patients, and in community settings and non academic hospital centres, they do assume this role. In each case, four categories of respondents were enlisted to reconstitute the training continuum: the associate deans of postgraduate studies and each program's director, educators, and final-year residents. Individual and group interviews were conducted with these key informants. In selecting respondents, we first enlisted the associate deans' support. Then, the program directors were invited to participate. Once these persons had agreed to participate, a site visit was organized. Residents and educators were invited through the program directors' offices, respecting the Ethics Board's privacy guidelines. For each case, our target was four educators per program, five or six family medicine residents, and up to four residents in each specialty, with the aim of ensuring representation of the variety of the programs' teaching settings. Respondents had to be available when the research team was on site. Associate deans and program directors were interviewed individually. Specialty program educators and residents were met either in groups or individually, to accommodate schedules and numbers of participants (most specialty programs had fewer than four final-year residents). All family medicine residents were interviewed in focus groups. These two interview methods were not employed for triangulation, but for logistic reasons. Focus group methodology has inherent limitations: greater superficiality due to the number of participants, and the influence of group dynamics, or "group censoring". To counter these phenomena, we frequently sought input from around the table and served as devil's advocate. Our interview guide covered respondents' visions of family physicians' and specialists' roles; their experiences of generalist-specialist collaboration; and their teaching experiences and perceptions of the importance attributed to this competency. The interview script was comparable for all categories of respondents, with minor adaptations to refer to their specific position (i.e. resident, educator, associate dean) when appropriate. After a general introduction presenting the study's objectives in the context of the evolving roles of physicians within the health care system, we began with the same question for all the respondents: "How do you see the role of specialists and family physicians in the Canadian health care system?" We then asked the respondents how the training prepared them, or their trainees, to play their respective roles and to collaborate with one another. We asked about their day-to-day experiences of collaboration, and the barriers and facilitators they encountered. We concluded with a broad question on their perceptions of the current challenges in medical education. Interviews were conducted by the researchers (MDB, LB; LS). Group interviews lasted 90 minutes and individual interviews, 45–60. Interviews were transcribed for analysis. The project was approved by the Research Ethics Committee of the Centre hospitalier de l'Universite de Montreal (CHUM) Research Centre. The immersion/crystallization method was used to analyze the data. Each researcher read all interview transcripts and consulting notes. Bringing their respective disciplines (sociology, social work, family medicine, specialized medicine) to the analysis, they crystallized out the most significant elements. They then combined their interpretations and compared themes and sub-themes; differences were resolved through consensus. Word processing software was used to code transcripts by themes. Two investigators (MDB, LS) independently reviewed the programs' official documents and extracted information pertaining to generalist-specialist collaboration. The analysis studied stated objectives, their type (institution-specific or from CanMEDS 2000) and degree of specificity, i.e., from general (e.g. collaborate with family physicians) to specific (e.g. explain the treatment plan). In all, 27 individual and 14 group interviews were conducted with 92 respondents, providing a comprehensive sample. All associate deans and all program directors, with the exception of two in radiology, participated. Table 1 presents our respondents' characteristics. Because no salient mission-based differences were observed between schools, this parameter was discarded during analysis. Results are organized in two sections: generalist-specialist collaboration in the formal curriculum; and collaboration as experienced in practice in academic medical settings. Content analysis of official documents revealed collaboration competency objectives in all programs. These were institutional, diverse, and mentioned under different competencies. In describing collaboration skills, specialty programs generally referred to the "interprofessional team" or "other health professionals", without specifically mentioning family physicians. All specialty programs identified referral and consultation skills under the "Medical expert" competency; three referred to specialists' responsibilities in the continuing education of generalists under the "Scholar" competency; two internal medicine and three psychiatry programs mentioned the importance of communicating information about patients to their family physician upon discharge from the hospital under the "Communicator" or "Collaborator" competencies; and four programs had indications such as "Demonstrate the attributes of a good consultant" under the "Professional" competency. All family medicine programs mentioned "learning to make appropriate and timely referrals" under the "Skilled clinician" principle; no other indication concerning relationships with specialists was found. This lack of detail and uniformity across programs was echoed in our interviews. All residents considered consultation skills a competency to be mastered, but generally indicated that learning intra-professional collaboration was not formalized in clinical rotations, except for psychiatry programs. Collaboration was learned "on the job", and location appeared to play a critical role. Indeed, indications were found that rural settings might favour better generalist-specialist collaboration, compared to university hospitals, where it was not considered a priority. Even if collaboration between family physicians and specialists is not always formally addressed in the curriculum, the academic training settings provide many occasions to experience it. From the interviews, it is clear that the referral/consultation process sets the stage for collaboration. Generally speaking, respondents expressed similar ideas on what constitutes effective collaboration: clinical relevance of the referral, good communication skills, and clear definition of responsibilities. However, in practice, collaboration runs up against certain obstacles and does not always meet expectations. Many issues were raised such as lack of clarity about the reason for referral or about the results of the consultation and confusion about each others' roles. Lack of time, fee schedule that does not permit reimbursement for telephone consultations and inadequate information systems were also identified as major irritants in day-to-day practice, mainly by the educators. Yet, many comments revealed more deeply-rooted problems. Those problems were classified under two major themes related to Abbott's conceptual framework: issues of professional responsibility and recognition of mutual expertise; and expanding distances between family practice and specialty care in the workplace and in the training programs. It was the specialty residents who had more perspective on the challenges of learning to work as consultants in collaboration with family physicians. When questioned about his supervisor's advice regarding such a situation, this resident responded that most often the decision was taken to pursue the investigation without notifying the referring physician. Overall, we noted that the educators were generally less reflective than the residents about the challenges of the consultation process and expressed more stereotyped negatively tainted experiences of intra-professional collaboration. Queried on the reasons for these collaboration issues, our respondents noted expanding distances between family physicians and specialists regarding the workplace and training settings, two key fields of professional identity enactment and development according to Abbott's theoretical framework. Our findings offer a deeper understanding of current shortcomings in teaching generalist-specialist collaboration. Analysis of the participating programs' objectives, combined with interview data, revealed that mastery of this competency lacked consistency and specificity across programs, with related training objectives scattered under several different competencies. Also, analysis of our respondents' statements brought up deeply-rooted obstacles to effective collaboration that cannot be reduced to issues of consultation or service organization. Our respondents described distances created between general practice and specialty medicine in the academic settings as a workplace and as a teaching environment. According to Abbott's framework, their discourses indicate that a significant amount of internal differentiation has occurred within the medical profession between family physicians and specialists in the teaching setting. Fragmentation of care in the workplace, due to the evolution of the health care system, has contributed to physicians' concerns and poor understanding of their colleagues' practice conditions. Furthermore, the divergent evolutions of the training programs seem to have also contributed to the divide between family medicine and specialties. While the words "trust" and "distrust" were never used, trust-related issues between family physicians and specialists were raised by all categories of respondents and appeared to be as important as those reported when collaboration between the medical profession and other health professions is considered. These results support the assertion that the differentiation of family physicians' and specialists' professional identities in the teaching setting has an incidence on their collaboration. Our data also suggest that teaching collaboration between family physicians and specialists is not high on the academic agenda and that the current training strategies and systems may be in part perpetuating the problem. It is interesting to note that, within our sample of respondents, residents were spontaneously more reflective on the question of intra-professional collaboration than were their educators, particularly residents in internal medicine and psychiatry. Among the educators, the specialists were more likely to express concerns about the increasing distance in the training curricula than were the family physicians. However, educators and residents in family medicine seemed bitterer about their overall experience of collaboration. The strength of this study is in its analytical approach based on Abbott's systemic theory of professions. Few authors have applied such a robust theoretical framework to the study of collaboration within a profession's sub-disciplines. Also, having respondents of diverse statuses in the training continuum as a whole was invaluable since not everyone was sensitive to the same issues of professional collaboration. We are confident our observations are credible. Given Canada's national accreditation process and the consistency of themes evoked by our respondents, selected to represent the different regions and missions, we strongly believe our data reliably depicts the situation in Canadian medical academic settings. The recurrence of themes in successive interviews confirmed that saturation was reached and that using two interview methods did not bias our results. However, there were indications in interviews of generalist-specialist interactions being more effective in rural contexts. Because this question could not be thoroughly explored in this study, we are cautious in stating that our findings may be more applicable to practice conditions in urban academic teaching settings. As to whether the specificities of the Canadian healthcare system affected our observations, we note that many of the tensions reported here have been observed elsewhere, such as in the US and Europe. Our observations might have been accentuated because of the co-existence of two systems of defining competencies in Canada, but references to family medicine's unique character as opposed to specialty medicine can be found in the position statements of most Western family medicine organizations [24–27]. Our analysis may not translate as well to non-Western countries, however, due to differences in training family physicians and specialists, although they may be faced with similar challenges as many are developing their primary care workforce. The professional distances noted here between generalists and specialists educators and trainees appear theoretically and empirically significant. They call for a reconsideration of current approaches to teaching intra-professional collaboration. Surely, the teaching of collaboration between specialists and generalist physicians merits as much attention as is currently devoted to inter-professional collaboration in the healthcare sector, and poses comparable challenges. Developing learning activities that foster the mastery of generalist-specialist collaboration while respecting each discipline's needs in terms of training environments remains an educational challenge, as is the case for inter-professional collaboration. Since the study was completed, both Canadian colleges revised their positions, and the CanMEDS roles are now used as the reference to physicians' roles independently of their discipline, although family medicine retained its four overarching principles to describe its specificity. This was decided to facilitate the development of conjunct teaching activities at the residency level and conjunct faculty development activities. However, many of the obstacles identified are directly related to the evolution of the health care system and the need for hospital settings to be more responsive to the primary care sector. Community hospitals are probably in a better position to adapt and it is not surprising that some of the residents we interviewed reported more positive experiences of collaboration between family physicians and specialists in rural hospitals. We could not explore specifically why this is so in this study, but we can hypothesize that family physicians have closer interactions with their specialist colleagues in the rural community setting as most of them still provide hospital care. In this regard, many of our respondents proposed bringing generalists back into the hospital as a solution to some of the problems mentioned here. However, like others, we believe this would run counter to the current evolution of health services. Models that bring specialists and generalists closer together in the community, where most care is now provided, would certainly seem more coherent, and academic urban teaching hospitals cannot shy from their responsibility to lead the way if they are to train the physicians of tomorrow. [8, 25] We feel the challenges to train future family physicians and specialists to collaborate effectively will not be met only through educational innovations; academic settings should also engage in the development of innovative models of care delivery. MDB is a family physician and is holder of a research chair in family medicine. LS is a radiologist involved in medical education at the Faculty of Medicine of the Universite de Montreal. LB is a social worker and works on interprofessional collaboration. He has been president of the Association of Social Workers of the province of Quebec. GR is a renowned sociologist working on the sociology of reforms in education and healthcare. MR was, at the time of the study, a doctoral candidate in sociology at the Centre de recherche en droit public and is presently employed as a research professional at the Quebec Ombudsman's Office. CDG is a sociologist working as a research professional in family medicine at the Centre hospitalier de l'Universite de Montreal Research Centre (CRCHUM). In this paper, we use "family physician" and "general practitioner" interchangeably to refer to the physician who deals with a variety of problems in a population of patients regardless of age and gender, in contrast with "primary care physician" that includes, in the US, specialties such as pediatrics, obstetrics/gynecology, and internal medicine. The authors wish to acknowledge the contribution of Donna Riley, translator and editor, in the preparation of this manuscript for publication. This research has received funding from the Royal College of Physicians and Surgeons of Canada as well as the Doctor Sadok Besrour Chair in Family Medicine of Universite de Montreal. Since the study was completed, Louise Samson has become President of the Royal College of Physicians and Surgeons of Canada (2006). Marie-Dominique Beaulieu is a member of the Collaborative Action Committee on Intra-Professionalism (July 2007), a joint Committee of the College of Family Physicians of Canada and of the Royal College of Physicians and Surgeons of Canada, whose mandate is to oversee productive action on the recommendations in the CFPC-RCPSC discussion paper entitled "Family Physicians and Other Specialists: Working and Learning Together" (2006). MDB, LS and LB were involved in every part of the study. GR and MR were involved in the conception and design of the study and in the analysis and interpretation of data. CDG made a substantial contribution to analysis and interpretation of data. MDB and CDG drafted the article. All authors revised the manuscript critically and approved the version to be published.